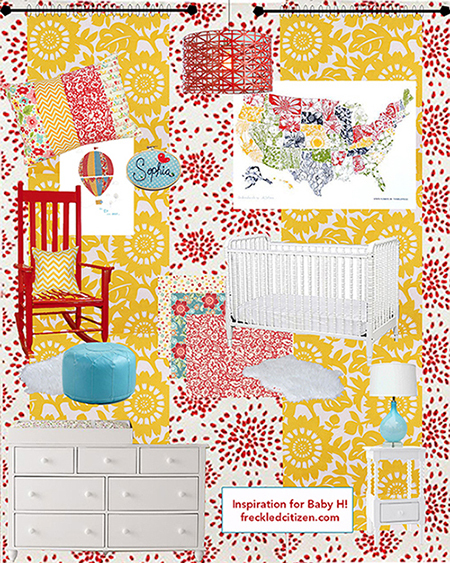 Freckled Citizen: Nursery decorating begins.... now. Looks fantastic. The stimulation for the baby will be fabulous and it will make you smile during the late night/early morning visits. The one thing we would re-do was chose a more sleep friendly rocker/glider. Our girl liked to sleep on you and our choice wasn't that comfy for that purpose. The pouf/footstool is awesome and we use her footstool for getting dressed everyday, pigtail adjustments and general play. It's super multi-purpose. Color is lovely. Great points Amy, see my edit above! Great design! I love that it's not pink. I'm not the biggest fan of pink myself, but unfortunately, you can barely find anything for girls that is not pink. It's already driving me crazy, and our girl isn't born yet! I can't wait to see the finished nursery. Love the bright, fun colors! Good luck finding that wallpaper. It's gorgeous and I'm partial to the designer's name seeing as our little one's name is Hadley. Isn't this too much fun already?! I love it! So cheerful! Is that a hint on Baby H's name I see? @Melissa: Ha, nope! Just the Etsy stock image :-). A pretty name, but not ours. What a great nursery! I love the colors and the patterns. I saw your edit on the rocking chair and I'm going to do what I do best: be an aggressive advice giver. You need to buy a glider. Marcus and I both spent hours upon hours in our glider at godforsaken hours and our kid was a sleeper. I'm going to say another thing that might not be popular: not only do you have to buy a glider, but you have to buy an expensive one. :) Forget about spending $$ on everything else. It's all in the glider. And usually gliders take six to eight weeks, unless you buy the store models (which could be an option). Ok. I'm done. I'll leave you alone. I just want you to be super duper comfortable when Baby H arrives. Love the bright fun colors and lack of pink. It's going to be beautiful! That Jenny Lind crib is gorgeous. Love the map print and the pops of blue in there too. I can't wait to see how it all turns out. And I also hate to give advice (because everyone is so different), but we really do spend a LOT of time in our stupid glider (oh so many hours upon hours of rocking) and it is important to have a comfy chair. Of course you can use a rocker, but you might also want a nice chair (maybe even somewhere else in your house, not necessarily the nursery) that you are ok spending hours in. Whenver Mac was sick (which happened a lot this winter) he would only sleep in our arms upright in that glider. I wish ours reclined so we could sleep in it as well. can't wait to see it! i know it'll be great. two things: get used to pink because EVERYONE will send you pink things. or everyone that doesn't know you well. ha, i've come to terms with it. I do agree on the glider recs, BUT, for us at least, it's more about having an accessible, super comfy spot where you can nurse / feed / sleep upright for hours on end than actual GLIDING. That might be your couch or bed or an overstuffed easy chair elsewhere in your casa, if the wooden rocker isn't conducive to marathon cuddle sessions! Oh my goodness, I LOVE LOVE LOVE it to pieces. We have that crib and dresser. I wish I had switched out different drawer pulls on the dresser, but I didn't know those existed when we bought it. I guess it's not too late! Anyways, YAY! I can't wait to see this all come together. I actually found bouncing on our exercise ball much more effective (read: faster) at putting our babies to sleep. Then again, I'm all about teaching babies to sleep without needing to intervene! So count me as a vote for the rocker + exercise ball that will fit nicely in that new closet!